What is Worst Possible Idea? 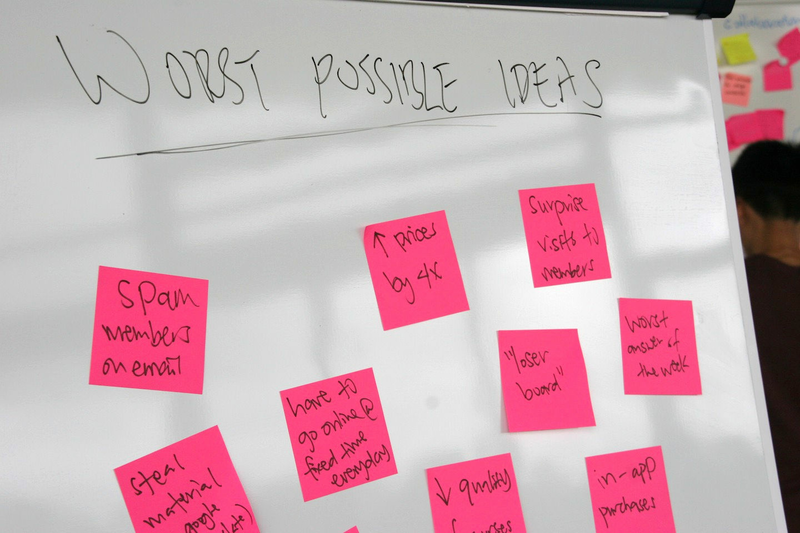 Worst Possible Idea is a Design Thinking technique where team members seek the worst solutions in ideation sessions. The “inverted” search process relaxes them, boosts their confidence and stokes their creativity so they can examine the ideas, challenge assumptions and gain insights towards great ideas. In group sessions such as brainstorming, although design team members technically may feel free to explore all possibilities on the road to the best solution, we can still clam up. Surrounded by peers, team members may be reticent to offer input, fearing their ideas will make them look silly or short-sighted. Team members may also hold back on mentioning—and subsequently forget—fragments or beginnings of plans that are actually valuable, fearing someone will rip their embryonic brainchild apart and humiliate them. Worst Possible Idea flips the playing field so that the name of the game is to produce the silliest, craziest ideas. Therefore, as nobody can look silly, nobody will worry about losing face. Better still, because the premise of the approach seems ridiculous, the group’s laughter relaxes us further as we proceed. At this approach’s core, however, design team members are actually seeking the lowest point on which to build; in a disarmed, no-risk setting, we will all find that “ground zero” far more quickly. The Worst Possible Idea technique, despite its name, is likely the best way to make a tight-lipped, self-conscious group relax in an ideation session, overcome the obstacles of traditional solution-finding, cast assumptions aside and locate diamonds-in-the-rough good ideas. Author, president and co-founder of The Growth Engine Company LLC, Bryan Mattimore captured the term’s essence when he described turning the search for innovative ideas with bankers—which had yielded no palpable results—upside down, thereby kick-starting a fruitful process. Soon, the search for downright awful ideas caused the group to loosen up by generating many seemingly ghastly notions, empowering them to get on track towards what would work. Design team members will invariably notice that the real power of Worst Possible Idea is what happens after we start feeling more at ease about offering our thoughts. We group members aren’t parodying brainstormers, but are bottoming out with notions, the worst of which will serve as specimens to dissect and markers to measure other ideas by. Although being free to kick back and try for the most ludicrous-sounding notions in a depressurized, judgment-free zone lubricates the ideation process, there is a method to the madness. Come up with as many bad ideas as we can. List all the properties of those terrible ideas. List what makes the worst of these so very bad. Search for the opposite of the worst attribute. Consider substituting something else in for the worst attribute. Mix and match various awful ideas to see what happens. What can come from Worst Possible Ideas? In identifying a rotten-looking or “preposterous” idea and deconstructing it to see what makes it tick as such, design team members can find powerful insights that may serve as kernels of good plans elsewhere.